04-Apr-2010 -- This is the first out of two confluence points that we visited during a short Easter vacation in the Caucasian Mountains. This confluence visit is – again – an excellent example that demonstrates how our world changes! The town Gori with its 50,000 people is located 10 km from the confluence point. Gori is synonymous with one man: Joseph Stalin, who was born and went to school there. In his hometown, he has enduring popularity which is proved by a museum devoted to him and a tall Stalin statue on the main square called – Stalin Square; this is right in the middle part of the wide Stalin Avenue that runs north-south. We had originally planned to walk the 10 beeline kilometres from the town centre to the confluence along Mtkvari River, but it was already 3:30 pm when we decided to visit the confluence point. Cold and strong wind gusts were extremely unpleasant and uninviting for a walk. Thus we hired a taxi which is normally a mode of transportation that I try to avoid. Although we were missing a common language with the Gregorian taxi driver, we somehow managed to have a nice talk that lasted until we reached the confluence point in the western edge of a village called Skra. We had a short 150 m walk until we reached the confluence location. From the picture of the previous visit, I had expected to find open agricultural land, but to our surprise we found ourselves surrounded by a residential housing area. It is now possible to drive up directly to the confluence point. To our measurements, the confluence is located exactly in the centre of this house. Since the last visit occurred six years earlier in summer 2004, there have been significant changes in the area. At that time the confluence was in the middle of a corn field. It is interesting to compare the view to the South between today and back then. Also the exact views to the North between 2010 and 2004 have changed enormously. The taxi driver had made some friends with the local people while he was waiting for our return. When we finally returned, a neighbour’s family gave us a bunch of local apples that had been preserved well during the winter time. Vegetation: scattered pieces of short grass with unidentified tiny blue flowers. 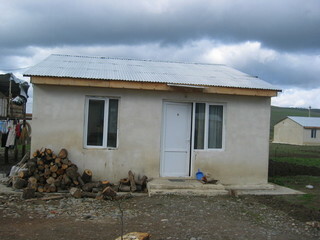 Description of the CP: Located not far from the geographic centre of Georgia in the region Shida Kartli, district of Gori, at the outskirts of the village Skra, 200 m from a railway line and 400 m from the river Mtkvari. Directly in a residential house, but in a agricultural dominated area. Story continues at 41°N 44°E.